Now includes the new "Remote Pilot" and "Unmanned Aircraft Systems" regulations (drones), 14 CFR Parts 48 and 107! ASA has built a reputation for providing the aviation community with the most accurate and reliable FAR/AIM products available. 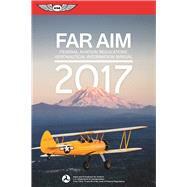 The 2017 FAR/AIM book continues this tradition, containing complete and up-to-date information from Titles 14 and 49 of the Code of Federal Regulations (14 and 49 CFR) pertinent to General Aviation, Sport Pilots and Flight Instructors, combined with the Aeronautical Information Manual (AIM), and a free email subscription service for you to receive updated information as it is released by the FAA. Convenient handbook-sized 6" x 9" format; see backcover copy and table of contents for more details. ASA's FAR/AIM Series has been the standard for printed reference books containing the aviation industry's regulations for more than 30 years. ASA consolidates the FAA regulations and procedures into easy-to-use reference manuals full of information pertinent to pilots, flight crew, and aviation maintenance technicians.